Ed Scharch reported October 26, 1943 to U.S. Naval Air Training Center (NATC) in Pensacola, Florida for Intermediate flight training. 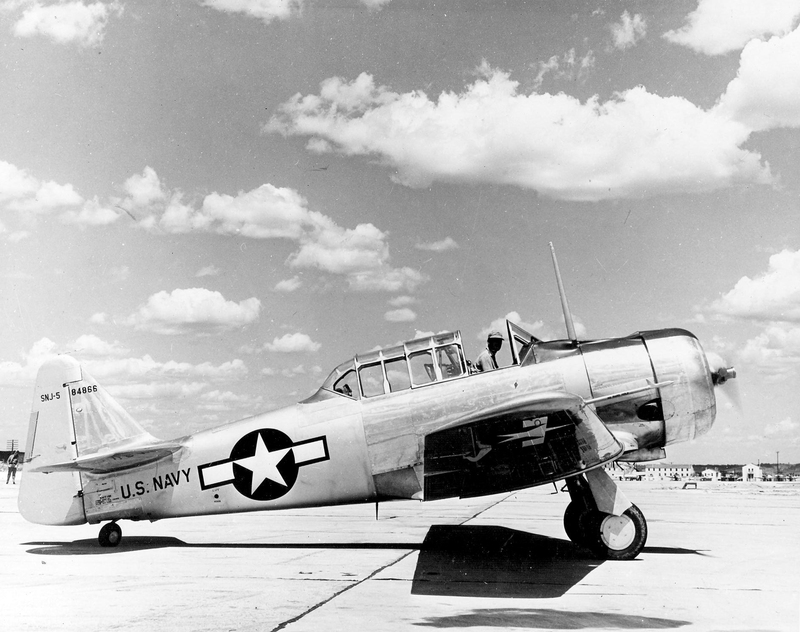 He spent many hours of flight time in the cockpit of an SNJ, one of the U.S. Navy's tandem seat trainers, which had full instruments and retractable landing gear. 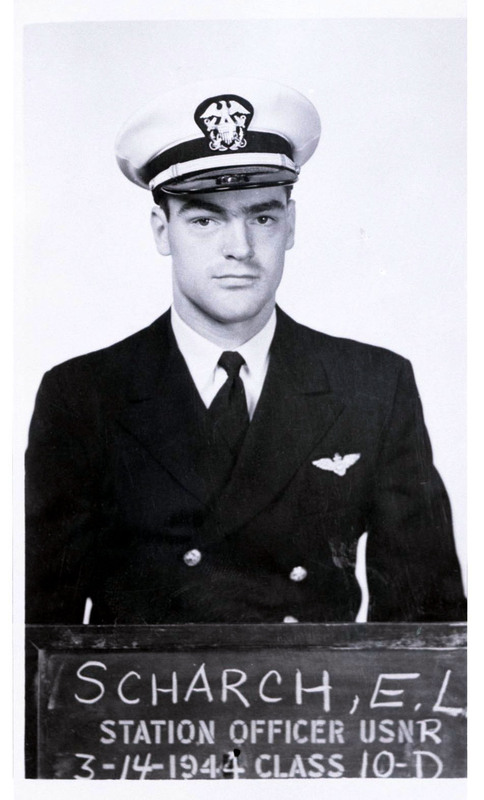 On March 14, 1944, after successfully completing "Intermediate" training, he was commissioned an Ensign and accepted his wings as A-V(N) Naval Aviator, USNR. Having received a Naval Aviator diploma, commission and wings, pilots were assigned to squadrons then sent off to an Operational Training Unit (OTU). Carrier pilots had an additional training hurdle with Carrier Qualification which took place aboard a "floating airfield." Graduates were sent to the Carrier Qualification Training Unit at NAS Glenview, Illinois. This was the second of three flight training stages for would-be Naval Aviators during WWII. The duration of the Intermediate flight training phase was about 14-18 weeks and included some 160 hours of flight time. Upon successful completion of his primary training, the AvCad moved on to Intermediate Flight Training. This training was usually conducted at naval air training centers such as NAS Corpus Christi or NAS Pensacola. In his intermediate training the AvCad flew service type aircraft (types in squadron service as opposed to training aircraft). Students were given the opportunity to request the type of aircraft in which they wanted to specialize. These types generalized as carrier (CV), patrol (VPB), utility (VJ/VR) or scout/observation (VO/VCS), although there was no guarantee that one would be assigned as requested. Initial intermediate training consisted of a refresh of skills taught in Primary Training in order to indoctrinate the AvCad in the operation of heavier, more powerful aircraft. 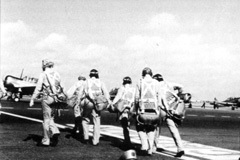 Instrument training was heavily emphasized with the use of Link trainers and “under-the-hood” flying. The instrument flying program began with basic familiarization with instruments and their part in trimming; straight, smooth flight; climbs, glides, spirals, stalls and spins; intricate patterns; recovery from unusual situations; and rough air procedures. This phase also covered radio ranging, beam navigation, and methods of orientation. The satisfactory check for this phase included demonstration of primary skills, instrument flight and navigation, and instrument guided landing. 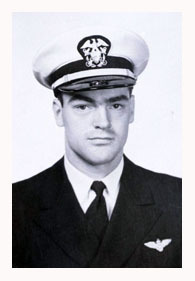 Ensign, Edward L. Scharch, A-V(N), U.S.N.R., graduated Intermediate flight training at NATC Pensacola on March 14, 1944. He received this Naval Aviator diploma along with commission as an officer. The next phase of intermediate training was Specialized Intermediate Training based on the AvCads' by now expected community assignment and centered on specific operational types. The VPB training was 90 hours and included six elements: seaplane and multi-engine land plane familiarization, instruments, navigation, formation, bombing, gunnery, and night operations familiarization. The VO/VCS training was also 90 hours and included floatplane familiarization in primary and operational types, formation flying, navigation, communications, and gunnery. Emphasis was given to water seamanship, gunnery and dive bombing. VF training was 100 hours and included familiarization, acrobatics, formation tactics, primary and advanced fixed gunnery, combat tactics, glide bombing, navigation, night flying and carrier operations. VSB training was 100 hours including familiarization, gunnery, as well as carrier operations and with the greatest emphasis placed on glide and dive bombing, navigation, scouting, communications and formation tactics. VT training was similar to VSB with the elements of the torpedo attack being the emphasis vice dive bombing. Intermediate ground school subjects included engineering and maintenance, navigation, communications, aerology, self-preservation and organization and operations of squadrons. At the completion of Intermediate Flight Training the Aviation Cadet was awarded his wings, as assigned a permanent Naval Aviator number and, except for a very small number of NAPs, was commissioned in the Navy, Marine Corps, or Coast Guard. Known as the "Cradle of Naval Aviation," Naval Air Station, Pensacola, Florida is where most Navy and Marine Corps aviators, past and present, began their flight training. Tens of thousands of naval aviators have been trained there, including astronauts Alan Shepard and Neil Armstrong. It is the home of the world renowned Blue Angels flight demonstration squadron. 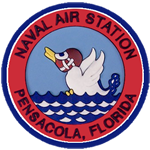 In October of 1913, Secretary of the Navy Josephus Daniels appointed a board that recommended the establishment of an aviation training station in Pensacola, making NAS Pensacola the first naval air station commissioned by the Navy. When America entered WWI, NAS Pensacola, still the only naval air station in the country, had 38 aviators, 163 enlisted men trained in aviation support, and approximately 50-55 fixed-wing aircraft. Two years later, NAS had grown exponentially with 438 officers and 5,538 enlisted men, and had trained 1,000 naval aviators. At the end of the war, aviation training slowed almost to a crawl, largely as a result of the Great Depression and post WWI military cutbacks. It was so slow in fact, that only 100 pilots on average were graduating each year. In the mid-1930s, the establishment of the aviation cadet program caused rapid growth. When Pensacola’s training facilities could no longer accommodate the ever increasing number of cadets accepted by the Navy, two more naval air stations were created - one in Jacksonville, Florida, and the other in Corpus Christi, Texas. The air station grew into an air training center. 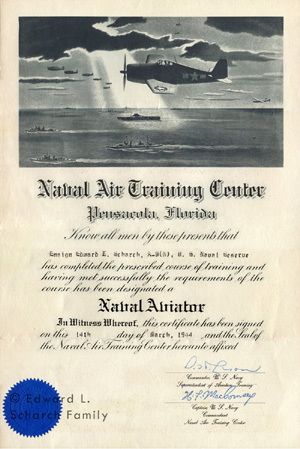 During WWII, training at NATC Pensacola increased dramatically, reaching its peak in 1944, with 12,000 men completing almost 2 million hours of flight school in that year alone. Those numbers dropped significantly after the war, but experienced a bump during the Korean war. 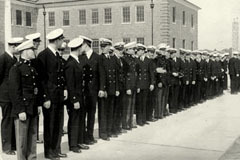 During the early 1950s, the Navy was in transition. 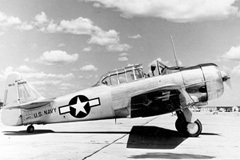 The old propeller type aircraft were being replaced by the much faster and technologically advanced jets which required NAS Pensacola to revise training techniques and courses. 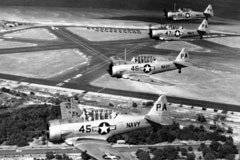 When the U.S. entered into World War II, primary flight training at NAS Pensacola's Chevalier Field increased in pace from 800 to 2,500 students per month. 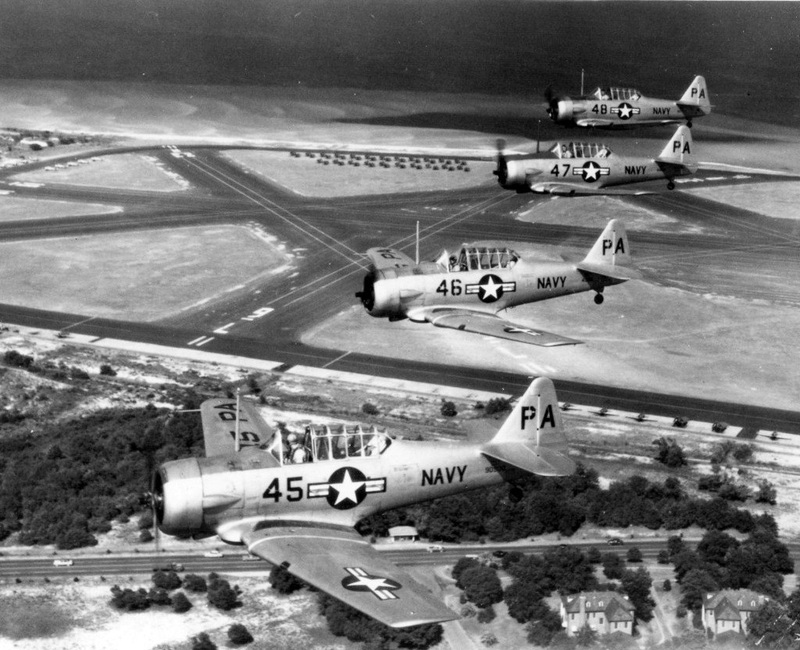 NAS Pensacola continued to gain additional outlying fields during the period. 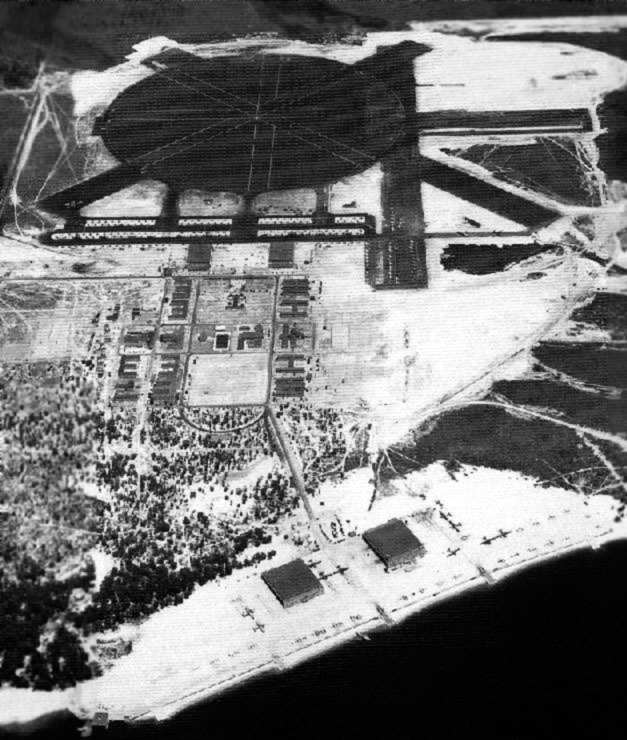 Several of these airfields were greatly expanded and designated as Naval Auxiliary Air Stations. 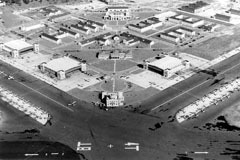 Primary flight training at Pensacola's Chevalier Field ended in 1943, and it became headquarters of the Naval Air Intermediate Training Command. 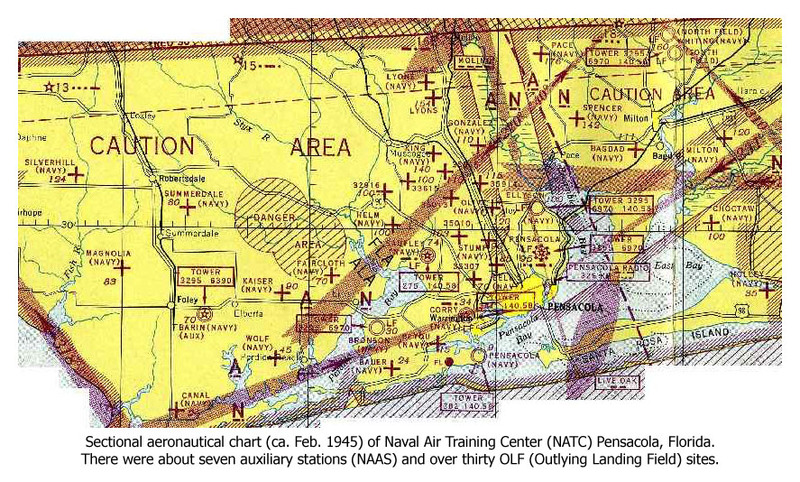 During the 1940s, the naval air training center commanded several auxiliary air stations and over thirty outlying landing fields. The following information focuses on a period between October 1943 and March 1944, when Ed Scharch was receiving Intermediate flight training at NATC Pensacola. NAAS Barin Field - Foley, AL. 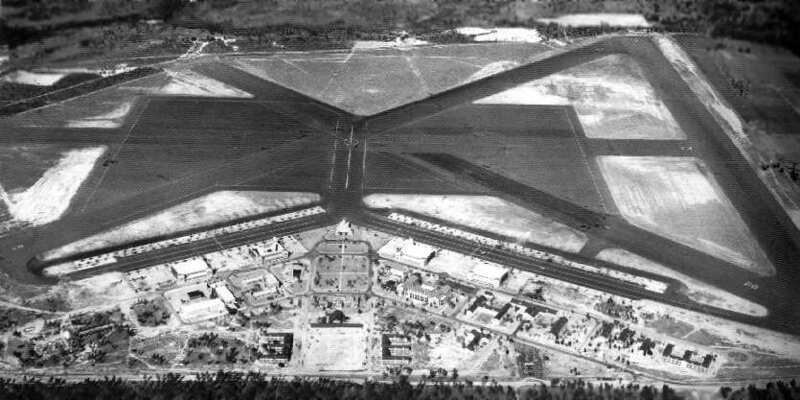 Barin Field was the only NAAS in Alabama, and it operated under the jurisdiction of NATC Pensacola. 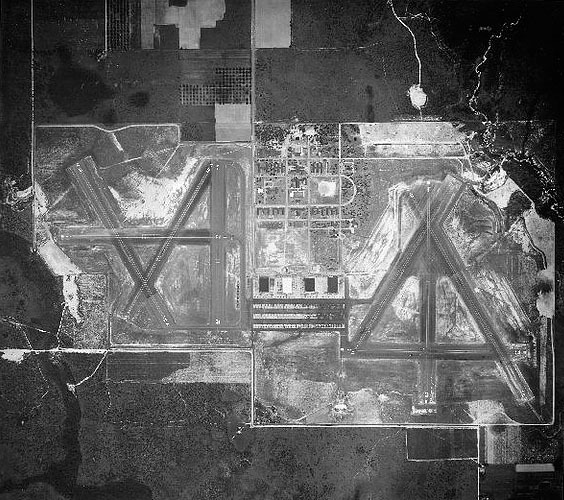 In 1942, the Navy leased the Foley Municipal Airport and also purchased adjoining land to construct a second airfield. Training at Barin Field first consisted of torpedo bomber & fighter instruction. Other aircraft used included OS2U Kingfishers, SNVs, and N2S Stearmans. 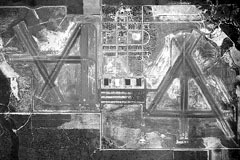 Barin Field had become an autonomous auxiliary station by 1943, with two complete sets of asphalt runways (east and west) separated by four large hangars, maintenance shops, barracks and administration buildings. Torpedo training moved to Corry Field, leaving Barin to focus on the fighter program using SNJ trainers. 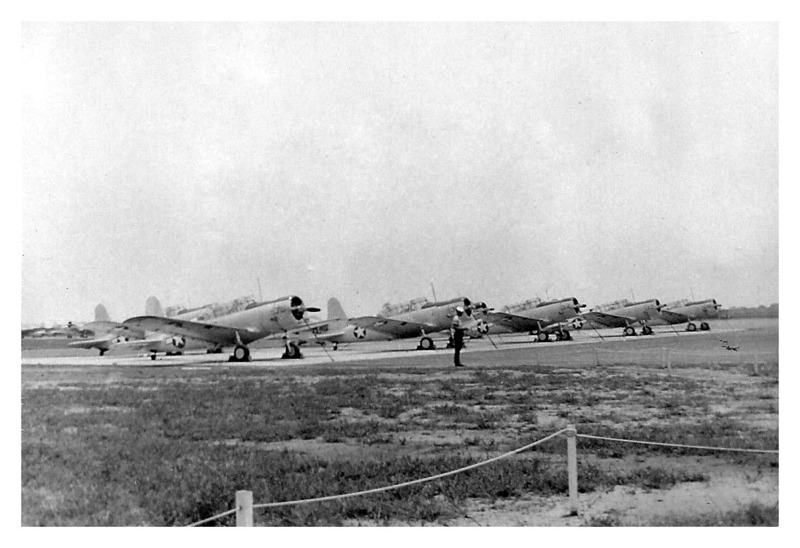 Before the end of the war, more than 400 training aircraft were based at NAAS Barin Field. NAAS Bronson Field - Myrtle Grove, FL. Located 9 miles west of NAS Pensacola. Originally called Tarkiln Field and located northwest of Pensacola, it was established in 1939 as an outlying field to Corry Field. 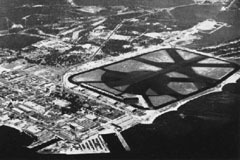 In 1942, a seaplane facility was added on the eastern shore of Perdido Bay. Both installations were designated a NAAS in late 1942, and it provided runways for landplanes and seaplane ramps for floatplanes. 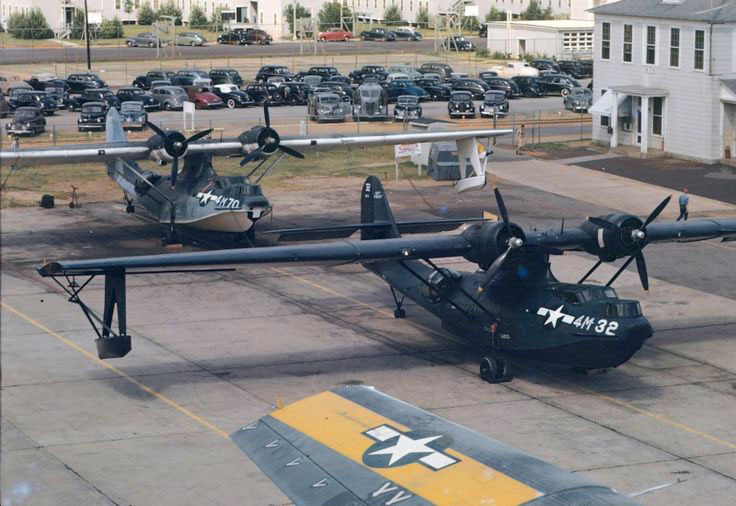 Training squadron VN-5 operated nearly 300 SNJs from Bronson Field, while squadron VN-8 operated some 40 PBY Catalina flying boats at the seaplane ramp. NAAS Chevalier Field - NAS Pensacola, FL. 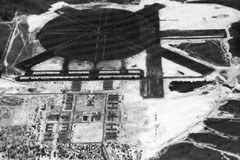 The training center's main airfield was built in 1922 and called Station Field. It was renamed Chevalier Field in 1935 and further expanded in 1938 to include schools for aviation medicine and aviation maintenance. 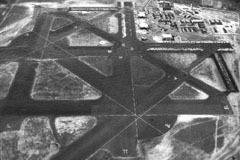 The airfield had seven asphalt runways arranged in two clusters that intersected at mid-field, with the longest at 3,100 feet. 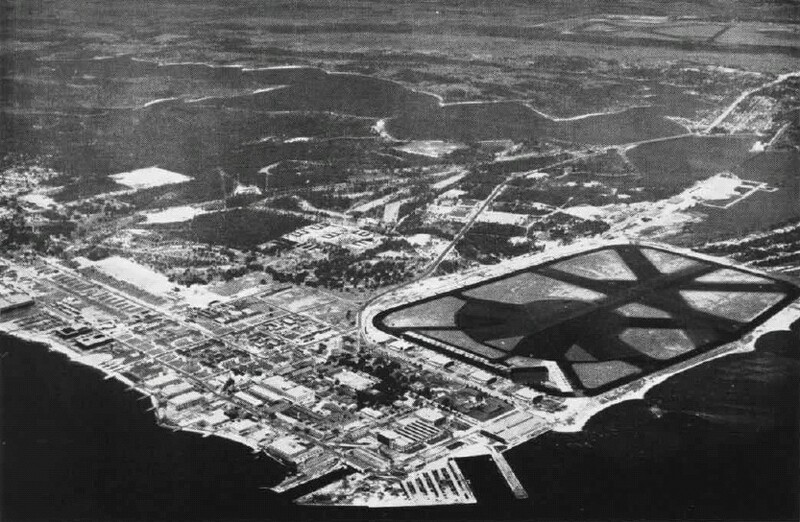 an extensive seaplane ramp and hangars were also added on the southeast corner facing Pensacola Bay. Variety of aircraft based here were the OS2U, SC & N3N floatplanes and PBY seaplanes, along with N3N, N2S, SNV and SNJ landplanes. NAAS Corry Field - Myrtle Grove, FL. The first auxiliary field established for the NAS. A newer Corry Field was built in 1927, west of downtown Pensacola. an active aviation training complex where advanced fighter plane techniques were taught. In 1942 the NAS Pensacola Transport Unit, flying PBYs, R4Ds and SNBs, was based at Corry. In January 1943, Corry Field was designated a NAAS. Squadron 8C conducted multi-engine patrol or VB-2 training in SNBs until moving in November 1943 to Whiting Field. Squadron 6 joined the unit in August 1943 and conducted carrier aircraft VTB (torpedo bombing) training initially in land-based OS2Us (and later SNJs) until the end of 1944. In the mid-1960s, for a time, Corry Field became a venue for sports car racing. An old track map shows the road course was laid out on existing runways, and it included some ten or more turns. NAAS Ellyson Field - Ferry Pass, FL. 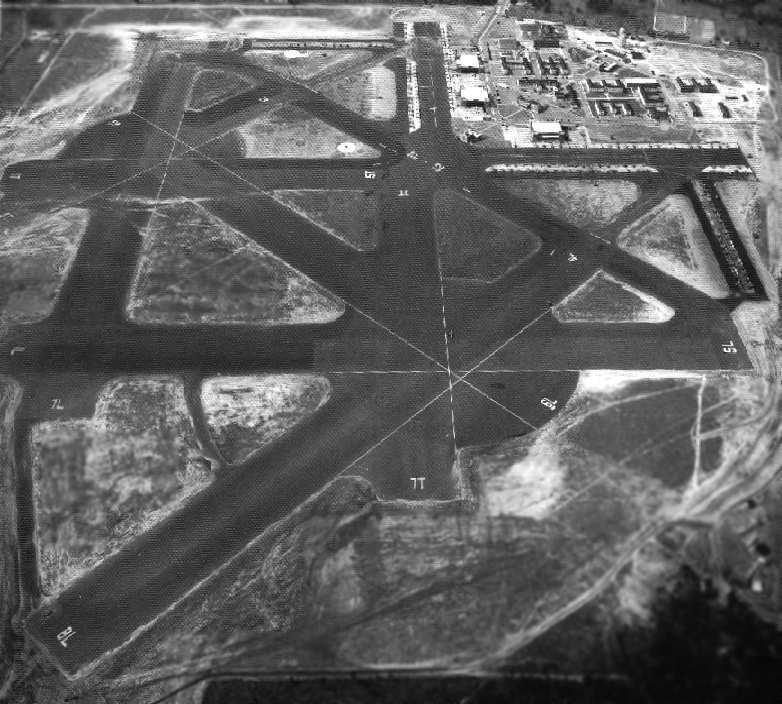 The airfield was first proposed in 1940 as an outlying landing field to support NAS flight training. "Site 3" was 12 miles north of NAS Pensacola. Construction began in 1941, but it was greatly expanded as the war intensified and cost more than $1.7 million. 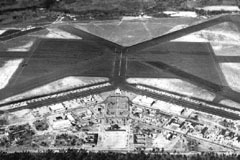 Ellyson Field OLF opened October 1, 1941, with six taxiways & runways, three hangars, administrative & operations buildings, barracks & mess hall. 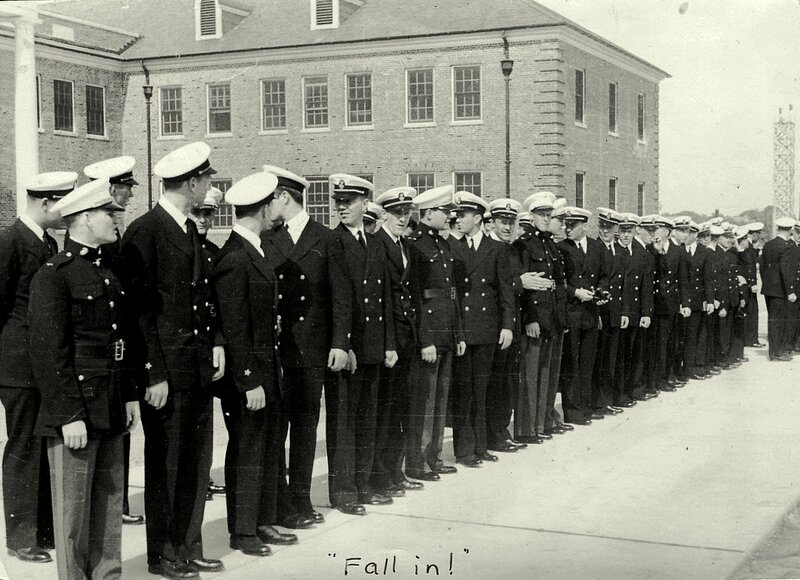 In 1943, the OLF was redesignated a Naval Auxiliary Air Station. Ellyson's only training squadron was VN-2A, and it conducted intermediate basic training until it was disestablished in 1945. The Vultee SNV 'Valiant' single-engine monoplane trainer was used for familiarization, formation & night flying. At its peak, the squadron operated almost 250 SNVs and conducted 4 weeks and 36 hours of flight training before the cadets, enlisted & officer students moved on to specialized intermediate courses with SNJ, PBY, SNB & OS2U aircraft. NAAS Saufley Field - Bellview, FL. Initially built in 1933, Felton's Field was 9 miles northwest of NAS Pensacola. The OLF was significantly expanded and renamed Saufley Field in 1940. It conducted primary training, instrument training, and fighter training. 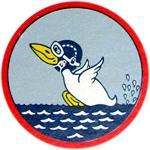 On February 15, 1943, Training Squadron Three Detachment 8-B (VN3D8-B) was organized at Saufley Field, but was relocated to Whiting Field on July 1, 1943. 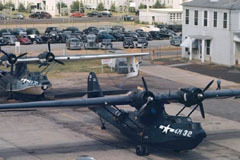 Saufley was commissioned a NAAS in 1943, and it provided a variety of training in N2S, PBY5A, SBD and SNJ aircraft. 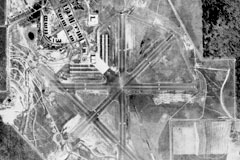 The airfield had a large rectangular asphalt mat at its center, over which four asphalt runways extended. The control tower and four hangars were situated on the south end. In 1944, there were 160 aircraft at Saufley and a station complement of over 2,200 men. The station also had several of its own OLFs during WWII, and it remained open after the war due to its substantial construction. NAAS Whiting Field - Milton, FL. Opened July 16, 1943 as an auxiliary air station to NAS Pensacola, located 28 miles northeast of the NAS. The new aviators first took up residence in tents. The airfield was built on 2,920 acres of agriculture land, and its complement grew to 3,300 officers and men and 1,431 students. 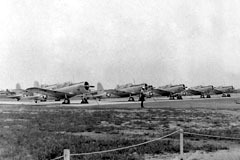 Training Squadron Three Detachment 8-B (VN3D8-B) was relocated from Saufley to Whiting Field on July 1, 1943 and later joined by VN3D8-A from Chevalier Field to form VN-3. Training aircraft used were SNBs, SNJs, and PBYs. WAVES operated Link Trainers (flight simulators) while on the ground. 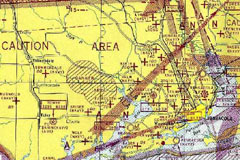 Outlying fields to Whiting included Choctaw, Holley, Milton 'T', and Pensacola Airports. 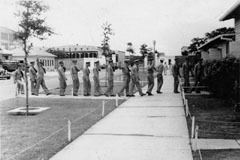 German POWs arrived at Whiting in July 1945 for duty in construction and soil erosion projects. The 225 detainees were released in March 1946. VN-3 squadron was decommissioned in 1947. NAAS Saufley Field Bellview Aux to Pensacola-Chevalier NAS; started as an OLF. OLF Holley Field Holley OLF to NAAS Whiting Field; aka Navarre OLF. OLF Milton T Field Milton OLF to NAAS Whiting Field; existing airport before war used by Navy. 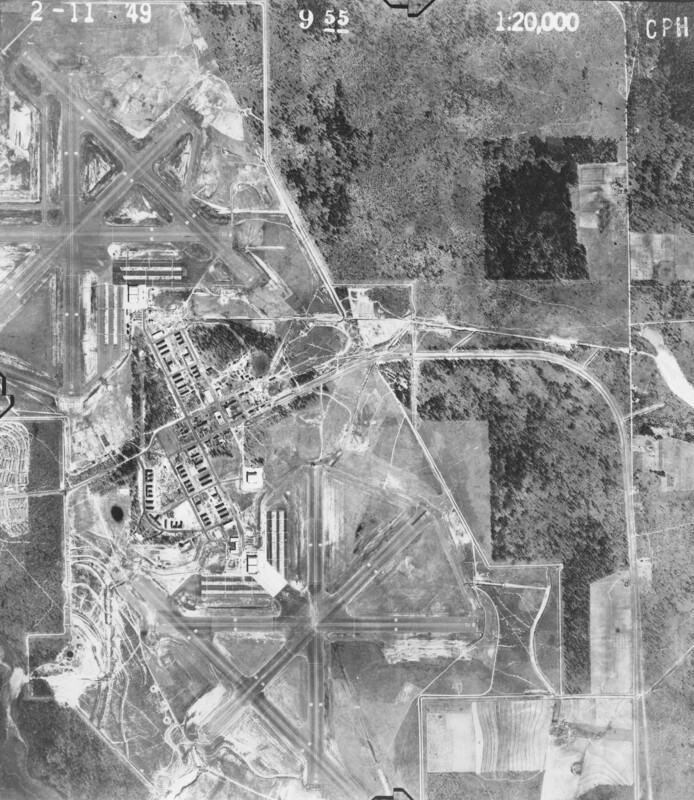 Municipal Airport) Pensacola OLF to NAAS Whiting Field; Joint usage with civilian operations. U.S. Naval Activities during World War II. Department of the Navy, Washington DC, 1945. The original is an unpublished, type-written manuscript provided by the U.S. Naval Historical Center.